There have been a number of proposals to change the design of the national flag. In addition to the high profile Ausflag Limited there are also a number of individuals who have designed and promoted their own personal vision for a new flag. Set out below is an amalgam of the various arguments put forward as to why Australia should have a new flag. It is accepted that the Australian National Flag has served Australia for over 100 years and through usage has become well known internationally. However, it is time for it to be gracefully retired and a more effective design adopted. There is no disrespect to the current flag in advocating a change; the current flag would continue to be honoured for its role in Australia's development as a nation. Ausflag and the designers of a new flag are as patriotic and proud of Australia and its achievements as the advocates of retention of the current flag claim. They believe that a new flag would be flown and used to demonstrate the same emotions and national pride as occurs currently. A flag is a symbolic representation of the nation and its people - these would not be changed by a new flag. What is sought is a new design that can help reinforce national pride with a strong and inspiring design that is clearly and distinctively recognisable as Australian. Ausflag's stated objective is "to secure the popular support of the Australian people for the adoption of a truly Australian flag, a flag which clearly and unequivocally proclaims our identity to other nations, a flag which is internationally recognisable and not confusing to other nations, and a flag which unites the Australian nation in all its diversity." A new flag design can better reflect the values and aspirations of 21st Century Australia than the current flag which reflects through its design and its history a long past Australian society, when it was an integral part of the former British Empire. The debate is not about being anti-British. It is, simply, pro-Australian. The current Australian flag is a British Blue Ensign with the addition of two emblems. The pattern of adding a badge to the fly of a British Blue Ensign was established in 1865 for use in all colonies within the British Empire. Each colonial governor selected a design for a badge to add to the colonial flag. Colonies were prohibited by the British Admiralty from having a distinctive flag in any other format. When Australia adopted its flag in 1903 the only variation to this colonial flag pattern was the addition of a second badge, the Federal Star. When the flag design competition was held in 1901, the judges knew that the only flag that would be acceptable to the British authorities was one that was a British Blue Ensign with a locally designed badge. Whilst the judges' decision stretched the colonial flag rules by using two badges, there was no option but to use a Union Jack in the top left corner of a blue flag (and a red version for use by shipping). Due to the gradual process by which independence was achieved, Australia never had the opportunity to raise a new flag at an Independence Day ceremony, symbolically representing the "coming of age" of the nation. Therefore, like Canada which changed its flag in 1965 (whilst retaining HM Queen Elizabeth II as Queen of Canada), Australia needs to reflect its current status as a fully independent country, respectful of its British history, but projecting through its flag an authentic and modern Australian identity. Whilst most independent members of the Commonwealth have distinctive flags, Australia is one of only four independent nations that retain the Union Jack in their flag. New Zealand also uses the Southern Cross (with red stars), whilst Fiji and Tuvalu changed the colour of their flags to light blue upon independence. A British ensign is also used by Cook Islands, Niue, Manitoba, Ontario, Hawaii and 15 British dependent territories. Internationally, Australia's continued use of a flag that includes the Union Jack is ambiguous - is Australia still a British colony? A national flag is a powerful symbol of the nation and it is important that the flag be truly representative of all Australians. Whilst ANFA claims that the "Stars and Crosses" represent Australia's values and legal traditions, many see only the British Union Jack and associate that part of the flag as representing only the Anglo-Celtic origins of what is now only one part of our multi-cultural society. Australian values go beyond the limited list of the rule of law, parliamentary democracy and the like, that is attributed to British heritage. Some advocates of change believe that the Australian national flag should include some acknowledgement of Australia's indigenous people, either to acknowledge their prior ownership of the land or to promote reconciliation. The widespread use of the Boxing Kangaroo flag and other sports flags demonstrates the inability of the current national flag to fully reflect the national pride and identification needs of ordinary Australians. 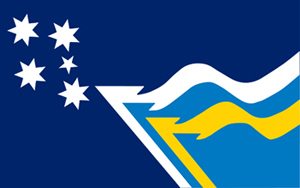 The design of the current Australian National Flag is criticised for lacking any distinctive Australian design elements - the Union Jack in the top left corner ("the canton") indicates, in heraldry, that the United Kingdom flag is superior to the other design elements; the Southern Cross is not unique to Australia - it appears on a number of other national flags of countries in the southern hemisphere; and the Commonwealth Star is meaningless to foreigners, unless they are explicitly educated about the meaning of the elements of the Australian flag. Many other countries include a large star on their flag. The debate about a change of flag is separate and distinct from proposals to change Australia from a constitutional monarchy to a republic. It is acknowledged that many of the arguments are similar and, if Australia were to become a republic, that change could be symbolised by a change of flag, but it would be equally valid to affirm the limited impact of a constitutional change by leaving the Australian flag unchanged. Australia, like Canada and 11 other Commonwealth countries could change the flag whilst retaining the Queen as Head of State. The argument that the current flag cannot be changed because Australia's defence forces fought under the current flag during two World Wars is considered to be a furphy. Australia's soldiers, sailors and airmen fought to defend their nation and to serve their country in the various wars in which Australia has participated - they did not "fight for the flag" but did fight for what the flag represents. A change of flag does not diminish their service. Canadian forces were a major part of the D-Day landings in 1944 and today the current Canadian flag is used to represent their participation, not the Canadian red ensign used during World War II. No accusations of disrespect to ex-servicemen were made when the flags used by the Royal Australian Navy and Royal Australian Air Force during World War II were changed. Advocates of change accept that the national flag should not be changed without clear evidence of widespread public support for a change. If necessary, this public support can be tested by a referendum or plebiscite, though the way in which such a public vote is conducted should be such that the public's opinions are genuinely identified, not using a referendum as a device for entrenching the current flag, which was the intended effect of the amendments to the Flags Act made in 1998. Advocates of change believe that there is a majority public opinion in favour of a change of flag, though there currently is no single new design that is clearly favoured. Change-advocates cannot be dismissed as a vocal minority or mere lobby groups. It is accepted that widespread popular acceptance for a new flag is a necessary prerequisite for change. Ausflag and many independent designers have strived to create and popularise an alternative flag design that has a superior design to the current flag and is capable of being inspirational. Debate about the flag and its future is an example of the healthy debate in a democracy that ensures the continued relevance of the national symbols.